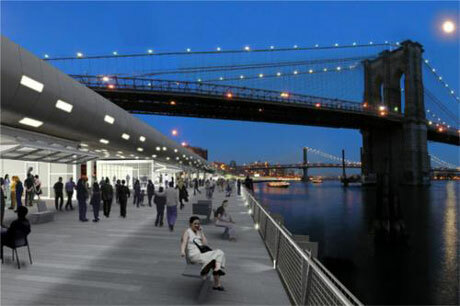 When the LMDC announced the plan it commissioned for the East River Waterfront, the images looked very familiar. They are almost identical in shape and character to the images I developped at Rogers Marvel Architects for the 55 Water Street Park (which we won, yo, and is being built, double YO, which is a yo-yo). I also led the RMA charge to get the East River project. We didn't get it, needless to say (so no yo, yo), but we were happy to see that really good architects had beat us out. The plan is safe, yet good. It provides a basic infrastructure for public life on this portion of the East River, without any pandering to historicism. And what plants! Ken Smith's landscape will flow from the new elevated park at 55 Water Street up the East River, and down to the Battery. You gotta give this guy credit: his first full-on profile in the New York Times (House and Home, or whatever they're calling it these days) was about how he had one table and plastic flowers in his apartment, and no public projects with living plants built. But he is as tireless in his pursuit of good public space as he is for good press. Which is a compliment, silly reader.